Brief records are short bibliographic records with minimal information that are often used as placeholder records until items are received. Brief records can be added to selection lists or purchase orders and can be imported into the catalog. 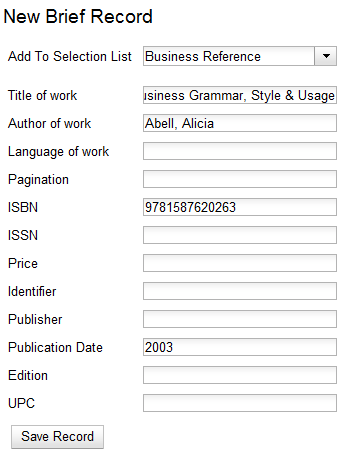 You can add brief records to new or existing selection lists. You can add brief records to new, pending or on~order purchase orders. Click Acquisitions → New Brief Record. You can also add brief records to an existing selection list by clicking the Actions menu on the selection list and choosing Add Brief Record. Choose a selection list from the drop down menu, or enter the name of a new selection list. Enter bibliographic information in the desired fields. You can add brief records to new or existing purchase orders. Open or create a purchase order. See the section on purchase orders for more information. Enter bibliographic information in the desired fields. 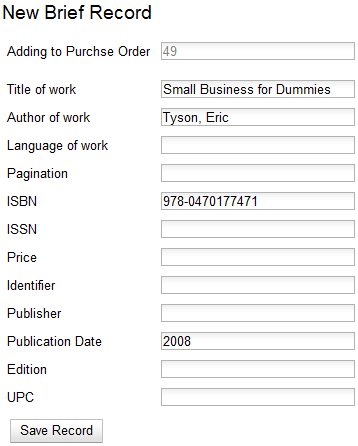 Notice that the record is added to the purchase order that you just created.